A fast paced mystery with supernatural elements, Dream State is a great introduction to the Sleeping Detective series. 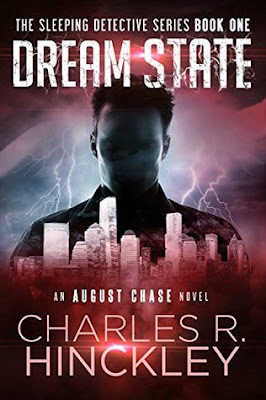 The whole concept of August Chase trying to prevent the deaths of people he sees in his dreams is quite thrilling. It's a race against time, firstly to find out the identity of the person, and then to convince them that their life is in danger. This leads to a lot of suspicion, fear and confrontation between August and the people he is trying to help. I loved the sub plot running through the novel. Chase sets up his own psychic detective business and his first client proves to be a challenge. Chase's abilities are tested as he tries to help a client find out what happened to his sister. This aspect of the novel was a source of humour but also nerve tingling and creepy! I can't wait to read more of the Sleeping Detective series. I was provided a review copy via Word Slinger Publicity.